It was a strangely surreal and emotional experience rolling off the DFDS seaways ferry into Port of Tyne yesterday, beneath a friendly blue sky. We had stood on the deck as the boat sailed slowly into the Tynemouth, past the familiar lighthouses and beaches we had used to visit in years gone by and it was as though our adventure had been a dream, albeit a very good one. This past 24 hours, living and moving around in our motorhome has been a peculiar combination of our old life in Durham and our touring life on the road. We've enjoyed hugs and greetings with good friends who have welcomed us back into their lives and homes and seen old familiar places as well. It's hard to know which of the two different lifestyles are real, or what that even means any more? Our final week on the continent based in Holland had been a whirlwind of family visits and activity that neither of us had expected or been prepared for, leaving us quite unexpectedly exhausted by the time we had boarded the boat in Ijmuiden the night before. It had been especially hard saying farewell to Esther's grandma, who will turn 98 in just a few weeks. As the boat had slowly chugged away from the sandy Dutch coastline beneath a misty sky the prospect of 17 hours to do little but relax and regroup for the next stage of our journey was a very welcome prospect. In fact, despite the on board entertainment on offer, including cabaret and cinema, in the end we had done little but sleep for over 14 straight hours in our peaceful little seaview cabin. Feeling refreshed but with few fixed plans for our time in the UK, besides a handful of appointments for the next 2 weeks and a list of jobs we wanted to tackle, we had driven through Newcastle, across the iconic Tyne bridge before parking at the equally iconic Angel of the North to try and organise ourselves. Precisely what would we be doing in the North East for the next couple of weeks was the question on our minds? Having decided that we wanted to continue travelling a while longer we had done all we could in advance to try and extend our journey, but there were still some things that needed our attention and we also wanted to spend as much time with the friends we had missed so much as we could. We were feeling more than a little guilt that we hadn't even had time in Holland to sit down and arrange times to see them. But any fears we had about dropping by at short notice were unfounded as we were made so warmly welcome. We got to visit Trish and Stuart who had loved and cared for two of our bunnies all year, spending some quality time with gorgeous little Alfie. We had then arrived unannounced at our dear friend Yulia's house on our way into Durham, as we remembered she might be off work this week, to find her waving out of the window with a big hug waiting on the doorstep. We had then squeezed in a trip to the doctors, met some more friends and even managed to recognise our amazing friend Ali's car making it's way into Tesco. At least we hoped it was her car anyway as we followed it round the car park before leaping out waving. Fortunately it was. It's odd that even after almost a year away so much our social lives seemed to centre on the enormous supermarket at the end of our old street. As the day drew to a close, enjoying a tasty homecooked meal and the very welcome offer of a bed back at Barry and Yulia's we reflected on just how natural it felt to be back in Durham. 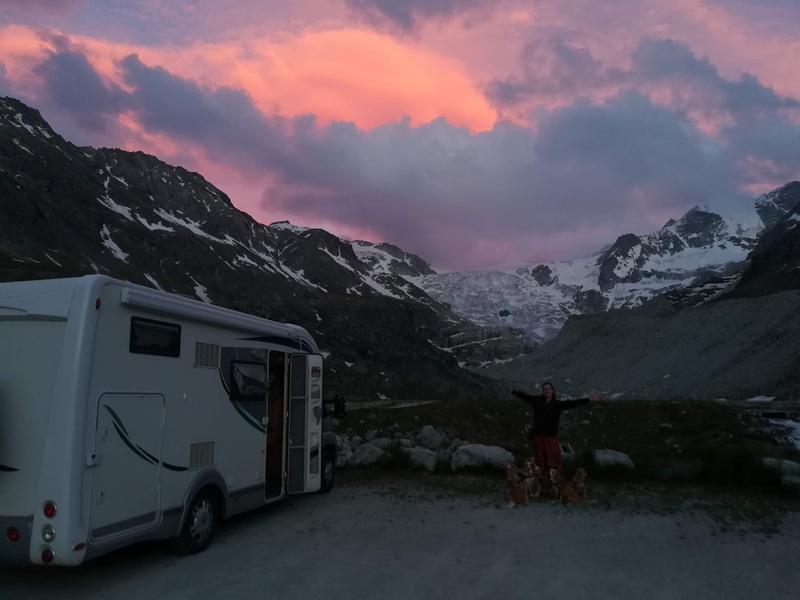 Although we were still living out of our motohome, it was as though our old and new life were merging into a happy hybrid of both the new and the familiar. Unlike 'holidays' where there is a very clear distinction between our 'normal' lives and our 'holiday time', being back in Durham had entirely blurred those boundaries in our minds and made us wonder if we could ever have that sense of normality. Or perhaps it was that the continued motion and change of travel had become our new baseline? But for now at least we were just happy to be back among friends and hopefully setting off on another round of adventure in the not too distant future.